Programme and Operations Management Consultant, Philippa Jones, presented Guildford High School's annual Science Lecture on Tuesday 19 March, telling students 'There's more to engineering than hard hats'. In her talk to the sixth form students, Philippa talked about some of the key challenges facing our society today, and the role engineering has to play in their solution. Her whistle-stop tour discussed the crossover between the tangible technical problems, and the softer aspects of process, people and change management required to develop and deliver solutions to these problems. 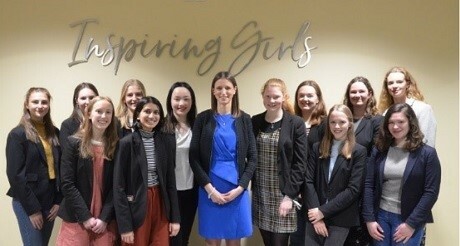 Philippa said: "Around a thousand girls aged four to 18 attend Guildford High School, and I wanted to share with the students how a career in engineering can offer a great opportunity to really make a difference to the world. I was able to tell them about the many interesting and challenging projects I've worked on across the defence, nuclear, rail and aviation industries and show them that engineering is everywhere - in places they might not even think of. "Having attended an all-girls school myself before achieving my degree in Mechanical Engineering at Durham University, I'm keen to dispel the stereotypical image that girls may have about engineering, and show that it can be a varied and rewarding career. I want the students to know that today, more than ever, engineering is more about thinking caps and less about hard hats."